WALRAA - International Women's Day is March 8: What are the obstacles facing women as they climb the career ladder? International Women's Day is March 8: What are the obstacles facing women as they climb the career ladder? PwC research, which involved over 40,000 Millennial's representing 18 countries, found that 82% of female millennials identified an employers’ policy on diversity, inclusion and gender equality as an important factor when deciding whether or not to work for an organization. Once hired, how will your organization work to address these daily challenges women face both professionally and personally? 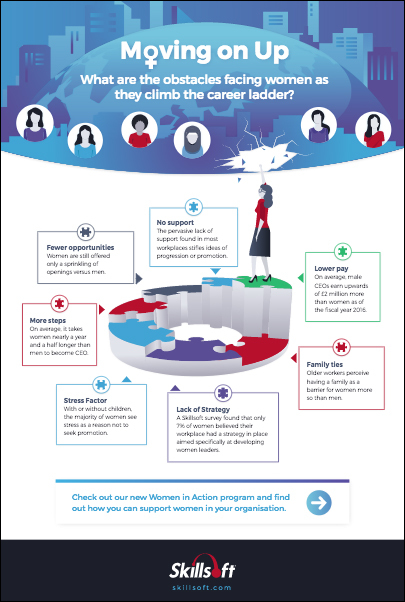 Read the above infographic to learn more about these challenges and how Skillsoft's Women in Action program can support the women in your organization.